How Secure are Lottery Machines? If you ask any security expert, they will tell you that no security system is 100% foolproof. Some may come close, but if someone is dedicated and skilled enough, it’s just a matter of time before they find the weak spot in your system. Lottery machines are no exception. They may benefit from a variety of security measures, but several people have already proven that circumventing a lottery machine’s security is quite possible. Thankfully, it’s not that easy! And for every lottery scammer that successfully cheats the system, lottery officials continue to adapt and improve lottery machine security. It’s why you can still safely play for the huge jackpots that the US Powerball offers! So, how do lotteries keep their machines from being rigged? To answer that, we must take a look at the different types of lottery machines. A gravity pick machine is regarded as the most secure of the two types of lottery machines. For that reason, it has become the go-to lottery machine of mega lotteries like the US Powerball, Mega Millions, Euromillions, and UK National Lottery. A gravity pick machine is composed of a clear drum with two paddles inside. Solid rubber balls are dropped into the drum chamber where the two paddles spin in opposite directions, causing the balls to get mixed and thereby ensuring fair number randomization. At the bottom of the drum chamber is a sliding door. Once it’s time to pick the winning numbers, the balls go through the door and into a clear tube one by one. Finally, after passing through the clear tube, each ball arrives at the display area where the numbers can be easily read. To prevent drawing more balls than necessary, gravity pick machines make use of optical sensors that automatically detect balls that pass through it. Once the threshold is reached, the door closes, and the draw ends. All of this happens live on television and the balls are always in full view of the audience, so any tampering is highly unlikely. Behind the scenes, the balls are tested before every draw. Every rubber ball must weigh precisely at 80g, otherwise they are discarded and replaced. Unlike gravity pick machines, air-mix machines use numbered ping pong balls instead of solid rubber balls. The balls are placed inside a clear chamber where a jet of air causes the balls to float and mix. Once it’s time to pick the winning numbers, an operator opens a valve to let air out through a clear tube on top of the machine. 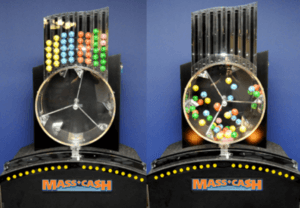 The balls are then sucked into the tube, transferred to the display area, and the winning numbers are announced. Like the gravity pick machine, all of this happens live and in full view of the audience, thanks to the clear chamber and tubes of the air-mix machine. As an added security measure, the size and weight of each ball is carefully calibrated. This is important because if some balls are heavier than the rest, floating to the tube and into the display area becomes much more difficult. In fact, Nick Perry, the former host of the Philadelphia lottery draw on TV, took advantage of this fact. With the help of local lettering expert Joseph Bock, he and his cohorts were able to manipulate the weight of the balls so that draw would be in their favor! Since then, however, lottery officials have improved lottery machine security to prevent a repeat of the infamous Triple Six Fix lottery scandal of the 1980’s. Every year, the US Powerball conducts a series of tests to ensure each lottery ball is up to par. They measure the size, weight, and density of each ball—plus, they also have them x-rayed just to make sure nothing has been placed inside. In addition, all ball sets and draw machines are randomly selected and tested pre-draw to ensure that they are working as intended. 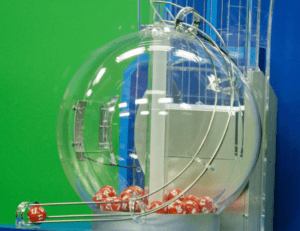 The US Powerball also uses two machines for every draw—one for drawing the white balls, and another for drawing the red Powerball. The Mega Millions lottery, which holds its draws at the WSB-TV studio in Atlanta, Georgia, employs tight security measures like that of the US Powerball’s. Draw machines and lottery balls are stored in a secured location where access is limited to a few approved officials. Once a draw nears, machines are randomly selected and are inspected by third-party auditors. Of course, Mega Millions’ security team also makes sure that the machines and the lotto balls comply with the standards and are free of any anomalies. After each draw, further tests are conducted to ensure that the draw was 100% fair and no tampering occurred. Two Mega Millions officials and an external auditor all conduct this post-draw test. The entire testing process is—as a final security measure—recorded on video. Like the US Powerball, the Mega Millions lottery utilizes two lottery machines during draws. As you might expect, one machine is used to draw the first five numbers, while the other machine is used solely for drawing the Mega Ball. The UK National Lottery means serious business when it comes to security. Not only are draws inspected by an external auditor, Camelot also employs the help of a Draw Manager to ensure that draws run without any issue. The National Lottery Compliance team is also on hand to ensure that each draw is held within regulations. Moreover, the National Measurement Office also conducts tests to make sure that lottery balls and draw machines are up to par. Just like in other lotteries, draw machines are sealed and stored in a secure location where access is extremely limited to a few individuals. Before every draw, the seals are checked for any tampering. In addition, ball sets and draw machines are randomly selected using shuffled envelopes. Basically, it’s like a mini pre-draw lottery. Fun fact: the UK National Lottery’s draw machines have their own names. Some are named after characters from the Arthurian legend, like Merlin and Lancelot, while others are named after precious stones, like Amethyst, Garnet and Opal. This makes it easy for the UK National Lottery to distinguish each machine. Some lotteries, like Hot Lotto, Hoosier Lottery, and Oregon Megabucks, have switched from traditional drum-based draws to completely computerized ones. While computerized lottery draws have their merits, some security experts are worried. And who could blame them? 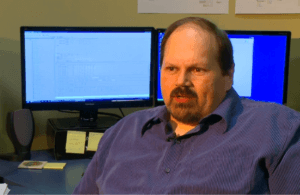 People like Eddie Tipton show that, with the right skills and access, a computerized draw system that has been compromised can cause more trouble than their analog counterparts. The now-incarcerated lotto scammer installed a rootkit program inside different lotteries’ RNG (random number generator) machines, which allowed him to “predict” the winning numbers. He and his cohorts profited for years thanks to this scam! With traditional draws, potential scammers face more hurdles. And even if they do manage to get past one lottery’s security, successfully pulling off the same stunt on another lottery—one with a different security system in place—is unlikely. To be fair, computerized lottery systems utilize various security measures, too. It’s not like anyone can emulate what Eddie Tipton did. Being an IT expert and the Multi-State Lottery Association’s security director back then, Tipton had knowledge and access no one else had. As it stands, however, drum-based draws are still better at offering fair and secure draws.